This Commissioner’s practice note is relevant to all businesses that procure the services of another person for a client of an employment agent. Payments paid or payable under an Employment Agency Contract are taken to be wages and may be liable to payroll tax under the Payroll Tax Act 2007 (the Act). This practice note will assist customers to decide whether their particular arrangements constitute an employment agency contract. Failure to pay tax could result in interest and penalties. What are the key elements of an employment agency contract? There is a contract, agreement, arrangement or undertaking. The workers are procured by the agent for the client. It does not matter if the workers were initially recruited by the client. Workers are procured for the client if the agent engages workers to perform its obligations under the contract. The workers are added to the workforce of the client and perform work in a similar way to employees of the client. When is a contract not an employment agency contract? There is a contract of employment between the worker and the client. The workers perform services for the client but do not work in the client’s business in the same way, or much the same way, as employees of the client. The workers perform services outside normal business hours and the type of services are not usually performed by the client’s employees. The employment agency provisions are in Part 3, Division 8 of the Act. An employment agency contract is defined in s.37(1) of the Act as a contract under which a person (an employment agent) procures the services of another person (a service provider) for a client of the employment agent. The definition of an employment agency contract, if applied literally, may apply to a broad range of contracts under which an agent places a worker with a client. However, the provisions only apply to labour hire type contracts, consistent with the intention of the provisions and recent decisions of the NSW Supreme Court. Labour hire contracts are primarily for the supply of workers by an employment agent to work for the agent’s client under the direction or control of the client. The worker may be an employee of the agent or an independent contractor, but is added to the workforce of the client for the conduct of the client’s business. The employment agent performs most of the administrative functions normally performed by an employer, such as payment of remuneration, withholding income tax and paying employer superannuation contributions. the contract must not be a contract of employment between the service provider and the client. An employment agency contract may include an agreement, arrangement or undertaking, whether formal or informal. It includes the arrangements between the employment agent and the client, as well as the arrangements between the service provider and the employment agent. Both arrangements must be considered. 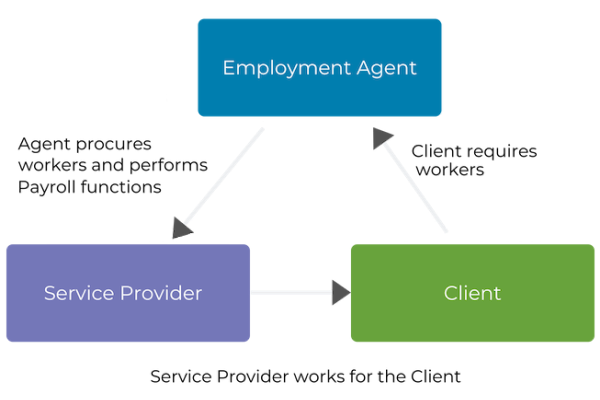 In some cases there may be a 3-party arrangement between the employment agent, the service provider and the client. An agent procures the services of a worker for its client if the agent is required to procure workers to perform its obligations to the client. The contractual requirement to procure workers may be specific or it may be necessary in the practical sense; (see H R C Hotel Services Pty Ltd v Chief Commissioner of State Revenue  NSWSC 820 at para 152). 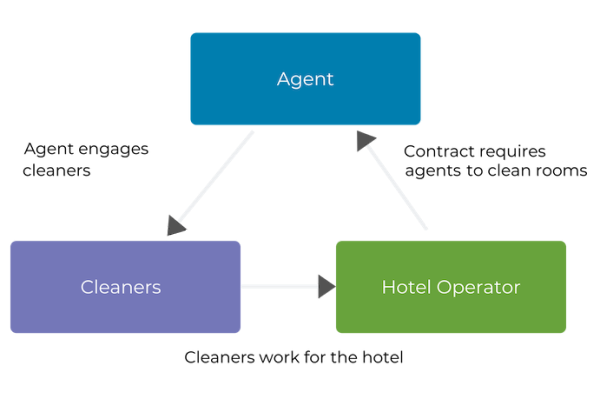 An agent enters into a contract with a hotel operator requiring the agent to clean hotel rooms.The agent will have to engage cleaners to perform its obligations under the contract. By engaging cleaners the agent procures the cleaners for the hotel operator for the purposes of s.37(1) of the Act. Note: By engaging cleaners the agent procures the cleaners for the hotel operator for the purposes of s.37(1) of the Act. A worker may be initially recruited by a client, with the initial arrangements between the worker and the client subsequently replaced by a contract between the agent and the client under which the agent engages the workers to provide services to the client (see Freelance Global Ltd v Chief Commissioner of State Revenue  NSWSC 127 at para 115). A security guard reaches agreement with ABC Bank to work at the Bank’s premises. The Bank provides details of the agreed arrangements to XYZ Security Services, which then enters into separate contracts with the Bank and the security guard to provide the services of the security guard to the Bank. 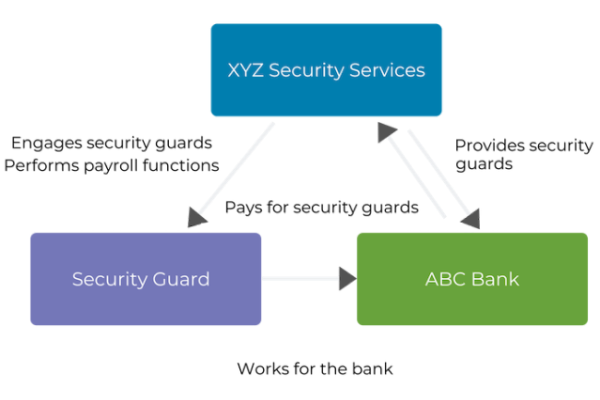 XYZ has procured the services of the security guard for ABC Bank for the purposes of s.37(1) of the Act. (However, such an arrangement will only be an employment agency contract if the worker performs services in and for the conduct of the Bank’s business). XYZ has procured the services of security guards for ABC Bank for the purposes of s.37(1) of the Act. An employment agency contract exists if the worker performs work “in and for the conduct of the client’s business”. This is the case if the worker performs work in the same way, or much the same way as an employee of the client (see UNSW Global Pty Ltd v Chief Commissioner of State Revenue)  NSWSC 1852 paras 62-63). The worker is, in effect, added to the workforce of the client for the conduct of the client’s business, and performs work under terms and conditions similar to, although not necessarily identical to, a contract of employment. The fact that a contract requires the achievement of a result or outcome does not preclude it from being an employment agency contract. If the workers, even if required to achieve a result or outcome, perform the work under terms and conditions that are similar to those that usually apply to employees, the contract is likely to be an employment agency contract. The factors listed in Revenue Ruling PTA 038 – determining whether a worker is an employee – are relevant in determining whether a worker is performing work in and for the business of the client. The table below identifies the key factors that indicate whether a particular contract is or is not an employment agency contract. While the factors specified in the table should be used as a guide, other factors may be relevant in particular cases. In each case the critical issue is whether, having regard to all relevant facts and circumstances, the worker is working in and for the client’s business, in a similar way to an employee, and not just for the benefit of the client’s business. 1. Control and direction of the worker The worker is under the day to day control and/or direction of the client. The worker is under the day to day control and/or direction of the person who provided the worker. 2. Responsibility for outcome and quality of work The person who provides the worker is responsible for procuring a worker with the skills required by the client. The person who provides the worker has little or no responsibility for the quality or outcome of the work performed, or does not bear the cost of rectifying substandard work. The client bears the risk of the project or service delivery. The person who provides the worker is primarily responsible for the quality or outcome of the work or bears the cost of remedial or additional work if required. 3.Time and place of work The work which the worker is required to perform is dictated by the client, at the client’s premises or at locations determined by the client. The work is performed at times and places determined mainly by the worker or by the third party providing the worker. 4.Duties performed The worker performs similar duties to existing employees of the client or performs duties previously performed by employees of the client. The worker performs duties which are not usually performed by existing employees of the client or were not previously performed by employees of the client. 5. Provision of tools, materials and equipment The client usually provides the tools, material and equipment necessary to do the work. The worker or the person who provides the worker usually provides any tools and equipment necessary to do the work. 6. Basis for payment of the procurer The person providing the worker usually charges the client a rate based on hours or days worked, or based on a result or output which is closely related to the time usually required to complete the task. The person who provides the worker usually charges the client a predetermined or fixed fee or a fee based on the output or result, unrelated to the actual hours or days worked. 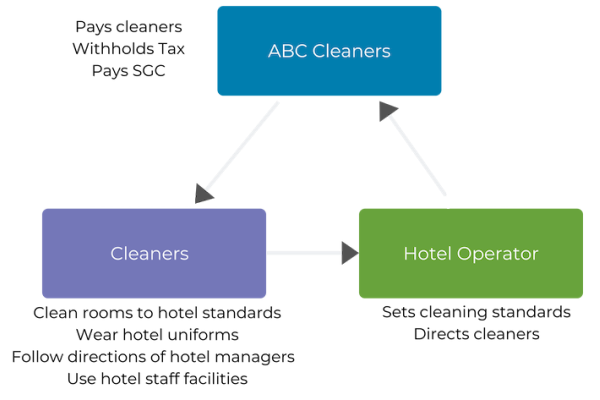 ABC Cleaning Services enters into an arrangement with a Hotel to provide cleaners to clean hotel rooms after guests vacate the rooms.The cleaners are required to work at times determined by the Hotel, they must wear similar uniforms to Hotel employees, follow directions given by Hotel managers, follow rules or standards of conduct applying to Hotel employees, and interact with Hotel customers in a similar way to Hotel employees. The Cleaners are working “in and for the business” of the Hotel, and for the purposes of s.39 of the Act, are taken to be employees of ABC Cleaning Services. The Cleaners are working “in and for the business” of the Hotel. 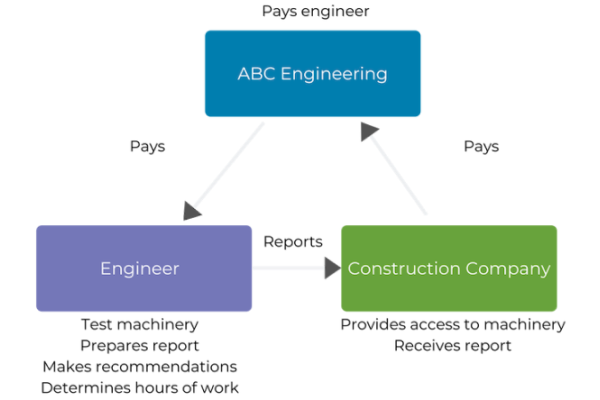 ABC Engineering enters into an arrangement with a Construction Company to provide the services of a Mechanical Engineer to review the use and performance of a piece of machinery and provide a report.The Engineer is required to provide the report by a specified date, and the work will require interaction with employees of the construction company who use the machinery.The Engineer arranges the times and places where the work is performed which are convenient.The contract is not an employment agency contract because the Engineer does not perform work which is usually performed by employees, and is not subject to the usual direction and control applied by the Construction Company to its employees. Appendix A outlines how the employment agency provisions apply to 2 alternative scenarios. The first is a case which is clearly an employment agency contract. The second is a case which is clearly not an employment agency contract. A contract that fulfils the requirements of being an employment agency contract cannot be a relevant contract under the contractor provisions in Part 3, Division 7 of the Act. However, if a contract or arrangement is not an employment agency contract, the contractor provisions may apply. Freelance Global engaged independent contractors to work for its clients. In some cases the contractor was initially recruited by the client. Freelance Global then entered into contracts with the contractor and the client to provide the contractor’s services to the client. a contract between an agent and its client is an employment agency contract if it provides the basis for a service provider to perform services for the client, even if the worker is initially recruited by the client. a contract that provides for delivery of a result can be an employment agency contract, noting that contracts with independent contractors generally include a requirement to achieve a result. UNSW Global engaged independent contractors to undertake specialised work or projects for clients across a broad range of industries. UNSW Global was responsible for vetting the work of the contractor in some cases to ensure it met the contractual requirements. in this case the workers performed services for a client’s benefit, but did not work in the client’s business, therefore the arrangements were not employment agency contracts. JP Property Services engaged cleaners to undertake after-hours cleaning services for various clients at a range of commercial premises including supermarket, hotel, and childcare businesses. a cleaner who performs cleaning services at a supermarket during working hours would be working in the supermarket’s business because the cleaner is discharging a function integral to the safe and lawful operation of the supermarket during that time. HRC Hotels Pty Ltd engaged housekeeping staff for hotel clients to clean hotel rooms to the requisite standard. The contract was structured by reference to room “credits rather than referring to the provisions of specified staff numbers. the arrangements were employment agency contracts because the workers were an addition to hotel’s workforce in a practical sense, they wore hotel uniforms, liaised with guests and other hotel staff and used staff facilities and were indistinguishable from hotel staff. This decision is subject to an appeal to the Court of Appeal by the Plaintiff. Trolley collectors are paid for hours worked. Does Trolley Services procure service providers for Supershops? Yes. The workers are engaged by Trolley Services to perform services for Supershops. Nor does it matter if a Trolley Collector forms a company, which contracts with Trolley Services to provide the services of the Trolley Collector. 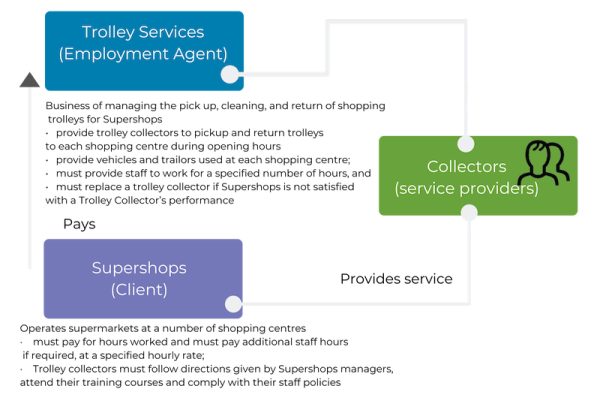 In such a case Trolley Services still procures the services of the individual (the Trolley Collector) for Supershops. Is this an employment agency contract? the supermarket must pay an hourly rate for additional hours of work. Specialist Projects arranges for industry experts in a particular field to provide consulting services in a range of areas of business expertise. It maintains a database of experts in specific subject areas. A client of Specialist Projects typically seeks an expert in a relevant field of work to perform a specific task or project requiring an exert in the relevant field. The work requires specialised skills that the client’s employees do not possess. The expert may be required to provide a written report and/or complete specified tasks. Specialised Projects calls for a quote for the work from one or more of the qualified experts on its data base. Specialise Projects negotiates a contract with the selected expert to complete the work, and then negotiates a contract with the client to provide the required services of the selected expert. The consideration payable by the client to Specialised Projects is generally a fixed price, but may include the cost of materials and it may provide for additional costs if additional services are subsequently sought by the client. The contract price includes the fee charged by the expert, plus administrative and other costs of SP, plus a profit margin. The cost of remedial work is borne by the expert and/or Specialised Projects. In performing the contract, the expert undertakes research and writes a report at times and places determined by the expert, who may use equipment such as mobile phone, computer hardware and software supplied by the expert. Some of the work may have to be performed at times and places determined in consultation between the expert and the client. The quality of the work performed by the expert is wholly the responsibility of the Specialised Services and/or the expert. The costs of remedial work if the requirements of the contract are not met are borne by Specialist Projects and/or the expert. Once the client is satisfied that the contract has been performed to its satisfaction, the client pays Specialised Projects, although there may be periodic or progress payments when key stages of the contract are completed. SP makes payments to the expert in accordance with the terms of their separate contract. 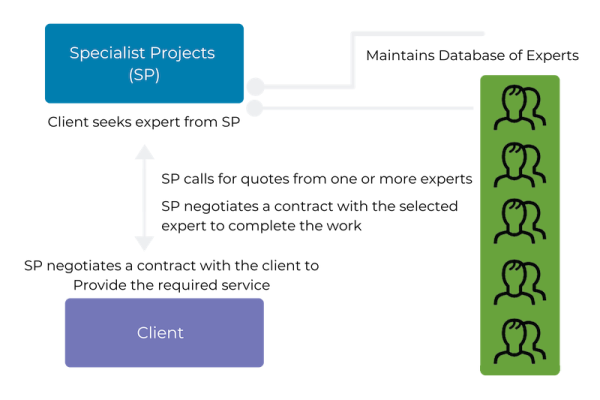 Does Specialised Projects procure service providers for its clients? Yes. The services of experts are engaged by Specialised Projects to perform work for its clients. Are the contracts employment agency contracts? The agent and/or the expert are responsible for fixing sub-standard work.